As chief tax collector, Zacchaeus’s job was to tax the Israelites living in the Roman Empire. Although it’s never expressly stated in Scripture, many believe that Zacchaeus used the position to collect more money than was fair. He took the excess to pad his pockets and live in luxury. But something happened to change Zacchaeus—the Messiah took notice of him. Sitting in a tree, he’d been hoping for just a glance of Jesus. What he received was an invitation to friendship. When Jesus told Zacchaeus that He wanted to come to his home, Zacchaeus joyfully accepted Jesus. He threw open his doors and served him the best of what he had. Because of his encounter with Jesus, Zacchaeus became a giver. Sometimes, giving doesn’t feel natural. Maybe you were brought up with a poverty mentality, a belief that there’s only so much to go around. But Zacchaeus shifted his focus from how much he had to how much he received. In light of the grace and friendship, Zacchaeus couldn’t help but respond in kind. When you focus on the depth and the breadth of God’s love, you’ll discover that there is often an overflow of abundance. 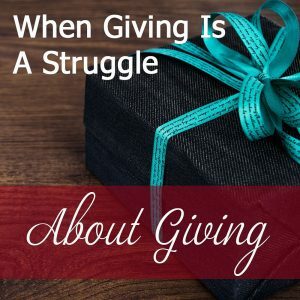 God, I confess: sometimes, I struggle with giving to others. I want to be more generous with my time, attention, and talents.